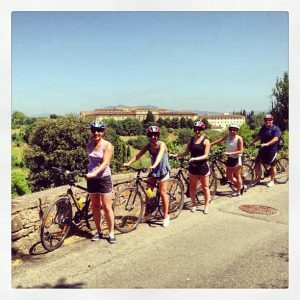 This half day tour will make you ride through Florence out into the Tuscan hills with a visit to a Renaissance villa winery for wine and olive oil wine tasting. The ride starts out with 2 km uphill ride, during which frequent stops will be made to enjoy the views on the way up. We will stop at a famous Renaissance villa tucked away in the hills, and we will duck into the ancient wine cellar to do a wine and olive oil tasting accompanied by a light Tuscan snack. All products are produced on premises and only sold locally. Our return ride back to Florence will take us by the amazing Piazzale Michelangelo where we will take some pictures at one of the best views of Florence. Then it is all downhill and back into the center of Florence, coming into the San Niccolò area and to our favorite gelateria to top off a perfect half day out! We will provide 24 speed bicycles, helmets and water bottles. The tour includes a delicious Tuscan snack with wine and olive oil tasting, a winery and cellar guided tour and the constant assistance of a and bilingual tour leader. Time a.m.: 9.15 a.m. to approx. 13 a.m. – p.m.: 4.15 p.m. to approx. 8 p.m.